Everyone has that childhood blankie, or a beloved toy you took everywhere to the dismay of whoever had to wash it. It’s safe to say that they were, well, probably pretty chill in the aesthetic department, yes? 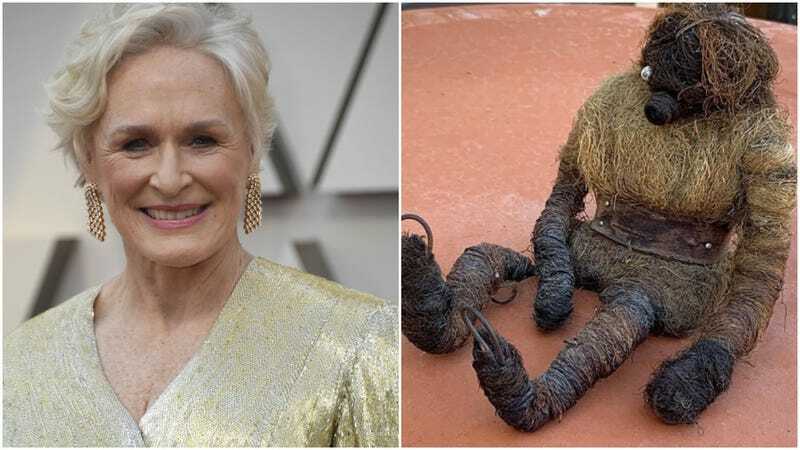 Not so for Glenn Close, whose childhood toy relic is... a troll. With how this thing looks, we’re guessing her “guardian” was good as hell at keeping any evil spirits at bay and, should Close be in need of souls, securing them handily. In this sense, it’s most assuredly served her well, though that doesn’t take away its vacant one-eyed stare, freakishly long arms, and hooked feet. To that point, it’s not something a lot of people would like just sitting in their house, ready to scare you every time you turn a corner. It’s made of reindeer moss which isn’t actually moss, but rather lichen, which is like a combination of algae and fungi or cyanobacteria, according to Britannica. It can withstand the cold really well, which is why it’s been dubbed “reindeer” moss, because it’s often found in areas where Santa’s helpers graze. It’s also used a ton in decorating and crafts as well, apparently. There’s a whole eight pages on Etsy dedicated just to the lichen, and you can of course buy some on Amazon. They come in different colors and amounts, and you too can go make your own terrifying Glenn Close reindeer doll.